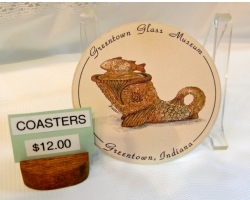 The Greentown Glass Museum was dedicated on June 13, 1970, the 67th anniversary of the burning of the Indiana Tumbler and Goblet Company. This brought to a reality the dream of several local citizens. They wanted a place to properly display over 700 pieces of the precious Greentown Glass so that visitors from all over the United States could see the colors and patterns in a tasteful setting reminiscent of the days when the factory was in operation. The museum was incorporated in 1969. The city donated space in the Greentown City Hall to be used for the museum. The Hook's Drug Company of Indiana donated turn of the century pharmacy cases to display the glass. 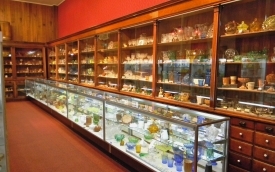 Today, over 2000 pieces of glass an historical items are on display. 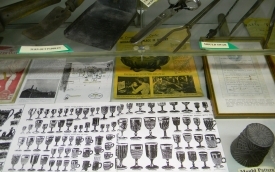 The museum operates solely on contributions, donations and souvenir and book sales. An Educational Exhibit displayed by the National Greentown Glass Association shows examples of all the patterns and colors of glass made by the factory. This exhibit includes an extensive display showing the differences between reproductions and the authentic pieces made at the Indiana Tumbler and Goblet Company. The mailing address is Greentown Glass Museum, P.O. Box 161, Greentown, IN 46936-0161. Greentown is located on SR 22/35 approximately 7 miles east of US 31 in Kokomo, IN. 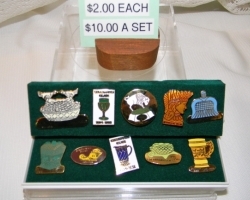 These pins were created by the National Greentown Glass Association starting in 1993 and ending in 2003 to commemorate the anniversary of the burning of the factory. They are $1.00 each or buy a packaged set for $5.00. Please contact the Museum at the number shown to purchase. 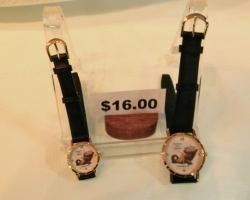 These watches are available in both men's and women's at a cost of $8.00 each. Please contact the Museum at the number shown to purchase. 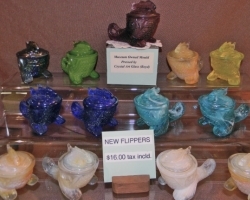 The Museum contracts with Boyd Glass to create a new color flipper each year. They sell for $8.00. Please contact the Museum at the number shown to purchase. Done by local artist Patti Host, these coasters are available for $4.00 each. Please contact the Museum at the number shown to purchase.